Ever needed to find your keys in the dark? Well, there’s an app for that. But beware, that flashlight app for your phone may be doing more than shedding some light in a dark room. In fact, if you have downloaded one of the popular flashlight apps from the Google Play Store, you have most likely installed malware on your phone. According to Snoopwall cybersecurity expert Gary Miliefskynt, that flashlight app for your phone could potentially be collecting your personal and private data such as banking information, contacts, photos, and videos. The statistics from are alarming; over 500 million downloads of the top 10 flashlight apps from the Google Play Store – and all of them are malware. That’s right, half a billion people installed a simple, everyday app on their phone and as a result have also installed malware on their phone without knowing it. This is no simple malware either; the permissions granted to these flashlight apps are alarming, from modifying or deleting the contents of your phone’s storage to providing your precise location via Global Positioning System (GPS). Most of us fly through the options when installing an app, but look closely at the flashlight app on your phone. Ask yourself – why would an app that lights up a dark room need access to Global Positioning System (GPS) satellites or require the ability to view or modify network settings? Simply put, the app should not need those permissions and are a clear indication of the devious intentions of the apps’ developers. These permissions allows the flashlight apps to steal data from your phone. For instance, if you conduct financial transactions with your bank, the flashlight app is likely stealing your sensitive banking information. These apps are not only stealing your data, they are also sending your sensitive information to locations in China, Russia, and India. Of course the app doesn’t just steal your banking information, it also has access to all of your contacts, pictures, videos, and other apps installed on your phone. Unfortunately, the problem doesn’t stop with stealing your data and invading your privacy. These flashlight apps most likely installed software that not only steals your data without your knowledge, but also makes it very difficult to completely remove the malware. Removing the flashlight app and malware from your phone is not complicated, but you must follow the proper steps. The software associated with the flashlight apps installs software into the deepest depths of your phone’s storage. By storing the software in this manner, the app developers have ensured their malware will stay on your phone if all you do is uninstall the flashlight app. 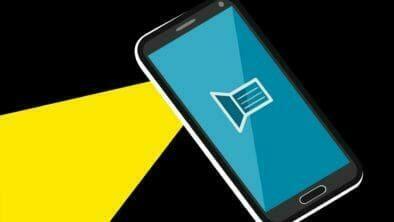 To completely remove the flashlight app, first back up your contacts and then perform a factory reset of your phone. Only a factory reset will ensure the malware hidden in your phone’s storage is deleted. If you find you just can’t live without the convenience of using your phone as a flashlight, Snoopwall provides a free flashlight appand a free app to scan your phone and see if any other apps are spying on you or stealing information from you. Don’t wait, check your phone now and take action to protect your privacy and your sensitive personal data. < Previous Are Ad Blockers the Right Solution for an Annoying Problem?